Due to the multi-buy promotions, such as two for the price one, the government consider of minimum price of alcohol. There are serious concerns that minimum pricing will impact upon the poorest in society to extent than the rest, while lining the pockets of producers, brewers and retailers rather than raise much-needed tax revenues. The UK’s alcohol problem is much worse than most European countries. “According to the ONS, in 2010/11, there was an 11 per cent increase on alcohol-related admissions giving a total of 1,168,300 admissions.” The aim of a minimum price would be to change the cost of heavily-discounted alcohol sold in supermarkets and shops. In this essay, we are going to analyse how the brewers has received the effect of the minimum price of alcohol. In the UK, there are many small firms in beer market so no one firm can dominate the market. It could be benefit for society because of price equals. There are numbers of beer products. Each firm invests advertisement in order to sell their own product. Increasing competition among firms is becoming either price equal or lower price. We know that there are different types of market. Oligopoly is a situation in which particular market is controlled by a small group of firms. Gas market, for instance, small number of firms control in the market. Although few firms dominate, it is possible that small firms may operate in the market. For example, British Airways and Air France operate their routes with only a few competitors, but there are also many airlines offering a low-cost airline. Monopoly is a situation in which a single company owns all of the market for product or service. In a monopoly market, there is no competition as firm sell a unique product in the market. “But whether an industry can be classed as a monopoly is not always clear. It depends how narrowly the industry is defined.”(John S) It is common knowledge that there is a huge beer market in the world. To be more specific, there are many kinds of lager firms in the UK market. Normally, Carling, Forster, Stella, Kronenbourg, and Inbev are well-known products in the UK. Barriers to entry in the beer market are low. “This means, anything that prevents or impedes the entry of firms into an industry and thereby limits the amount of competition faced by existing firms”. Any new firms can be easy to enter in the market. It already exists hundreds of products, but it is difficult to survive because of high quality competitors and unfamiliar to public. In the beer industry, barriers to entry would be high because of the legal costs and the manufacturing and distribution economics of scale required completing in such a large market. Also an entering firm would have limited access to distribution channels. This is because the wholesalers who served the largest brewers did not carry other brewer’s beer. The exit barriers in the beer industry are very high. Brewers have invested huge money for infrastructures so it is not possible for them to exit. They have to keep on selling to have money to keep on improvement their products and distribution networks. We call things ‘demerit goods’ that people over-estimate their utility and under-estimate their harmful effect and pains caused by them. For example, alcohol, cigarette, drug, prostitution belong to demerit goods and the government restrains and controls the production and consumption of them. In the economics, these goods or services are called ‘demerit goods’ which include drug, cigarette, prostitution, alcohol and so on. Then why do people over-estimate their utility and underestimate their disutility. People who enjoy drinks alcohol maintain that drinks help them build the interpersonal relationship, maintain and develop them. And these are inevitable things to make the feast more cheerful and relieve the sadness and pains. Price elasticity measures the responsiveness of demand to changes in price. Specifically, elasticity is the measurement of how one percentage (1%) of responsive variable is to a change in certain percentage of demand. For example, if the price of beef raises 1% and the amount of demand decreases 5% the elasticity of beef for demanding is 5. In case of alcohol, that is a high price elasticity of demand. Because of alcoholic beverage is kind of demerit good and demerit good has high price elasticity of demand. This graph showed that elasticity and inelasticity of demand. 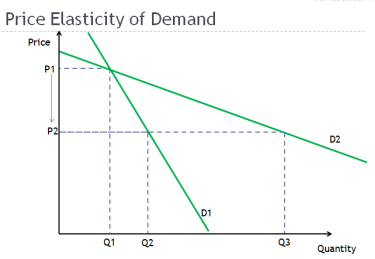 The demand curve as D1 showed that goods which are inelasticity of demand. If the price is changed as P2 from P1, quantity of demand is a little higher. It means that it is necessary goods. For example, flour, sugar, salt is necessary goods. Demand curve as D2 showed that goods which are elasticity of demand. Because, small change in price as P2, bigger quantity of demand as Q3. It means that it is demerit goods. The prices of every goods are included tax. In case of demerit goods, most prices of products are tax. Because government appreciate the danger of demerits goods and government restrains and controls the production and consumption of them. For example, even though we can see beer (alcohol) advertisement on TV, we cannot watch high percentage of alcoholic beverages (Whisky or wine) or cigarette advertisement on TV. Because government know dangers of these things in society and they try to regulate it. In the UK, duty rates of cigarette that 16.5% of retail prices plus £184.10 per 1000 cigarettes. And even though the tax of alcohols are different depending on alcohol percentage, there are high percentage of taxes are included in alcohol. Thus, meaning of raising tax in demerits goods that price of goods are rise. Because, production cost of demerits goods are not too much higher than tax of goods. This chart showed that supply and demand of alcohol. Small change in price of alcohol, bigger change in quantity demanded. When the price of alcoholic beverage is P1, the equilibrium point in the alcohol market is E1. 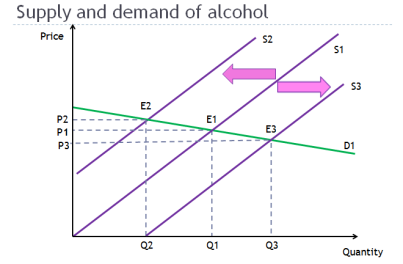 However, if the price of alcohol is little higher as P2, quantity of demand is largely decreased as Q2. Therefore, supply curve shift to left as S2. And the equilibrium point became E2. In contrast, if the price of alcohol is little lower as P3, quantity of demand is largely increased as Q3. Therefore, supply curve shift to right as S3. And the equilibrium point became E3. Minimum Prices is price control system with Maximum Prices in order to complement the adverse effects of a market. The systems are also needed for social justice and welfare in a country. The Government can set a minimum price to ban selling commodities and services below fixed price floor by the government. A minimum price is a system to protect producers and workers. The price floor has to be set above the equilibrium price to be effective. The representative examples of minimum prices are setting price floor in agricultural markets and minimum wages introduced by the Labour Government in April 1999 (Sloman, Wride and Garratt, 298). Among them, the minimum wages is good example of minimum prices. 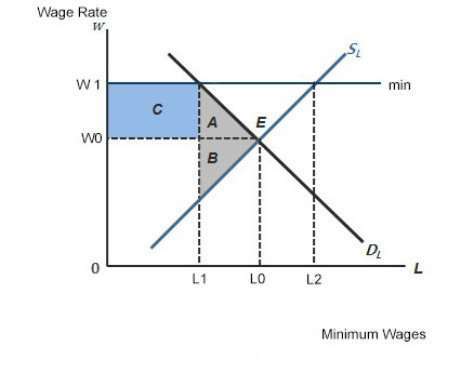 The equilibrium point of the labour market is E. Therefore, the equilibrium wage and labour is W0 and L0. If the minimum wage set at W1, the wages increase W0 to W1. If so, the supply of labour grow L0 to L2, but the demand of labour decrease L0 to L1 and the number of job declines as L0L1.Thus, a involuntary unemployment as L0L1 and social welfare loss as A+B caused by the introduction of minimum wages. Consequently, the minimum wage can rise wage of labour, but it also cause unemployment and social welfare. The government is considering to enforce minimum prices on units of alcohol in order to decrease alcohol fueled violence and the public health problems associated with excessive drinking. In UK, drinking has decreased since 2004, breaking a five-decade upward trend. Also, the consumption of alcohol units by 16 to 24-year-old is declining. Nevertheless, many heavy drinkers are still existed and people drink more than at least twice than the recommended daily limit in UK (The Economist). According to the British Crime Survey, Alcohol was a factor in half of all violent offenses in 2009-10. The government thinks that the problems are caused by a cheap price of liquor in UK compared to other European countries. If the government sets the minimum price on liquors, the alcohol price will increase. Suppose the average price of a beer was 40P, but the UK government sets 50P as a minimum price on units of alcohol. A manufacturer of beers in UK cannot sell their products below 50P. As the result of the minimum price, people will decrease the consumption of beer (beer is the main drink in UK). 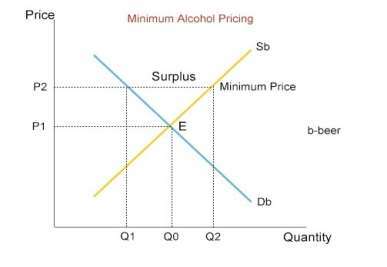 If the minimum price of beer is established at P2 which is above the equilibrium price, the price of beer will increase P1 to P2 and the quantity demanded will fall Q0 to Q1. Therefore, surplus is caused by the minimum price so lager companies will start to decrease the surplus in order to avoid loss. Some companies might even leave the beer market to enter new profitable market. However, It is just theoretically possible. I believe lager companies will not suffer heavy losses. They even get more profit due to the minimum price as the beer price is inelastic. People without the poor class still purchase beer at the slightly higher price than before introduction of the minimum price. If the government imposes the minimum price as 40P, producers and retailers in alcohol market will get an estimated £850m (IFS,Institute For Fiscal Studies). The policy only makes the consumer burden bigger than the lager company’s burden. To solve this problem, they should increase tax on beer. The increased tax revenue could be spent on various national campaign to decrease the drinking problems. The UK government has confirmed alcohol floor price plan to ban extreme discounting of alcohol in England and Wales and it comes into effect on 6 April (BBC 2014). There are many disputes about the policy. The opposition insists the alcohol floor price will worsen the rich-poor gap and social inequalities. The drinking problem is associated with custom not with price. Thus, the government should find more comprehensive measures to solve the problem. BBC Health, 2012. Minimum price plan to end cheap alcohol sales. [Online] Available at: http://www.bbc.co.uk/news/health-20515918. [Accessed 5 May 2014]. Chaplin R., Flatley J. and Smith K.,2011.Crime in England and Wales2010/11.Findings from the British Crime Survey and police recorded crime.2nd ed.[ONLINE],978-1-84987-486-1. GOV.UK. (2014).Alcohol and tobacco duty rates.Available: https://www.gov.uk/alcohol-and-tobacco-excise-duty. [Accessed 1 May 2014]. Rodda, C. (2012).MERIT GOODS and DEMERIT GOODS.Available: http://www.chrisrodda.com/meritgoods.html. [Accessed 29 April 2014]. Sloman J., Wride A. and Garratt D.2012.Economics.8th ed.Harlow:Pearson Education Limited. Tejvan P, 2013 Minimum price for alcohol-pros and cons, [Online] Available at: http://squarelyrooted.com/2013/02/25/barriers-to-entry-in-the-beer-market-are-low/. [Accessed 4 May 2014]. The Economist. 2012. Alcohol policy On the floor. [ONLINE] Available at: http://www.economist.com/node/21551517. [Accessed 02 April 14]. http://www.parliament.uk/business/publications/research/briefing-papers/SN05021/alcohol-minimum-pricing. [Accessed 02 April 14]. "UK Government Pricing for Alcohol." UKEssays.com. 11 2018. All Answers Ltd. 04 2019 <https://www.ukessays.com/essays/economics/uk-government-pricing-alcohol-8901.php?vref=1>. "UK Government Pricing for Alcohol." All Answers Ltd. ukessays.com, November 2018. Web. 21 April 2019. <https://www.ukessays.com/essays/economics/uk-government-pricing-alcohol-8901.php?vref=1>. UKEssays. November 2018. UK Government Pricing for Alcohol. [online]. Available from: https://www.ukessays.com/essays/economics/uk-government-pricing-alcohol-8901.php?vref=1 [Accessed 21 April 2019]. UKEssays. UK Government Pricing for Alcohol [Internet]. November 2018. [Accessed 21 April 2019]; Available from: https://www.ukessays.com/essays/economics/uk-government-pricing-alcohol-8901.php?vref=1.